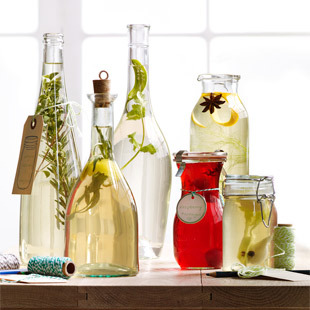 Make your own holiday food gifts with these 6 different infused vinegar recipes. What do you get when you combine vinegar, a few easy-to-find ingredients and a dash of ingenuity? Infused vinegars that will add panache to salads, steamed veggies, soups and sauces. Better yet, since they allow you to flavor dishes without resorting to salt or fat, they allow you to cook healthier meals too. They’re the perfect homemade, natural gift for all the cooks in your life. Find the Bottles: The sources for the bottles we used (from left to right) are prop stylist Jennifer Barguiarena’s personal collection, Sur la Table (Bormioli Rocco Gorica Cork Bottle), thrift store, Heath Ceramics (Weck Single Carafe/.25L Juice), thrift store and World Market (Spice Jar with Clamp Lid).